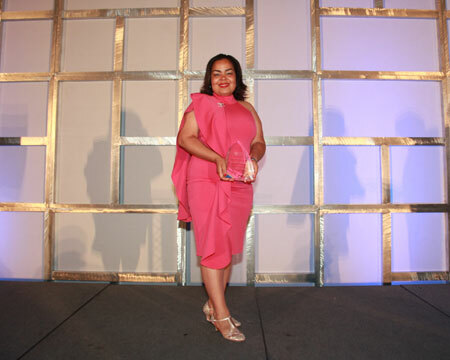 Congratulations go out to Jeannette Ramcharan of Bowie, Maryland, who was named as the 2018 Notary of the Year at the NNA 2018 Conference in Las Vegas, Nevada, on June 5. Ramcharan was recognized for her admirable service for helping others despite any hardships that would arise. It was through her work with the elderly, disabled community that inspired her role in service as a Notary Public. "By being who you are each and every day, you improve the image of the American Notary office and you're a role model for the entire Notary community. Congratulations, Jeanette!" said NNA President and CEO Tom Heymann during the award presentation at NNA 2018’s Gala Banquet. Ramcharan is the co-founder of The Heaven Sent Foundation, a charitable fundraising and philanthropic services organization that provides assistance to children, individuals, and families who have any emergency needs. At the age of 38, life took an unexpected turn and Ramcharan was diagnosed with breast cancer and became uninsurable. "When I was diagnosed with breast cancer my situation gave me the fuel to do even more," she said. Since then she has become heavily involved with giving back. Her foundation accepts donations to provide food, clothing, school supplies, and other necessities to families nationwide. They also sponsor health fair outreach programs for the community to provide health screenings, breast cancer awareness, chemotherapy support, and health care education. She also hosts regular "Will-a-Thon" events to provide no-cost notarizations for seniors, veterans, and the disabled. "Thank you all so much for believing in me. Sometimes things get hard and we have to keep pushing forward," Ramcharan said. In addition to Ramcharan, Beatriz Mendoza of Santa Ana, California; Phyllis E. Traylor of Schertz, Texas; and Crystal Whiteside-Lemon of Middleburg, Florida, were recognized as 2018 Notary of the Year Honorees. They all personify the best traditions of public service and consumer protection. Each year, the National Notary Association recognizes Notaries from among a group of exceptional individuals nominated for outstanding professionalism, ethics and philanthropic efforts in their communities. Read more information about Jeannette Ramcharan in the upcoming July issue of The National Notary magazine. If you would like to nominate someone who goes above and beyond the Notary Public call of duty, please fill out the nomination form. Trying to grow my notary business. I don't know what I'm doing wrong i'm networking, signing with other agencies as a subcontractor notary. I just seem to not get a break. I know some months are better than others I don't want to give up but I just don't see the money coming in. It depends where you are located. South california, for example, is inuandated with notaries, so work assignments are going to be less, especially if you are new and inexperienced. Just be patient and try to get a mentor, eventually you’ll get your break once they know your work.